The upcoming release of the next SuperTuxKart version is getting very close! 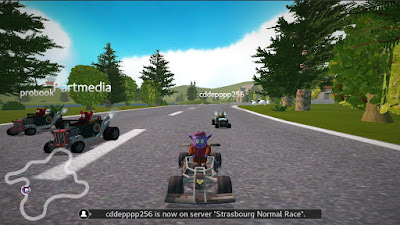 Several hundred players tested online networking with thousands and thousands of races. 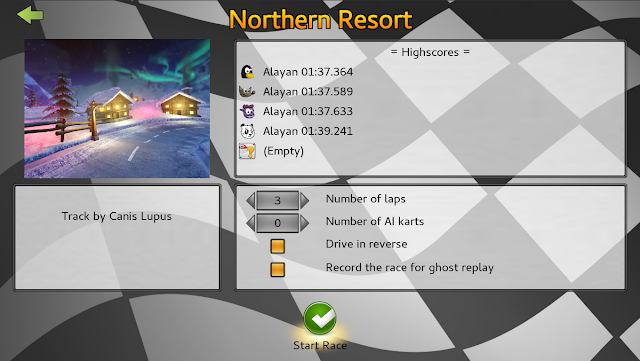 While it was already very playable, the beta helped to catch a few nasty bugs which are now fixed for the release, and to get gameplay feedback, as online races have a different balance compared to races with AIs. But in this blog post, our main focus will be gameplay, with all the changes applying to both single player and multiplayer compared to 0.9.3. The basis of STK's gameplay remains unchanged: drive along the tracks while trying to drift and collect nitro, using items to boost yourself or attack other karts, but the next version includes many evolutionary improvements to enhance fun and balance. 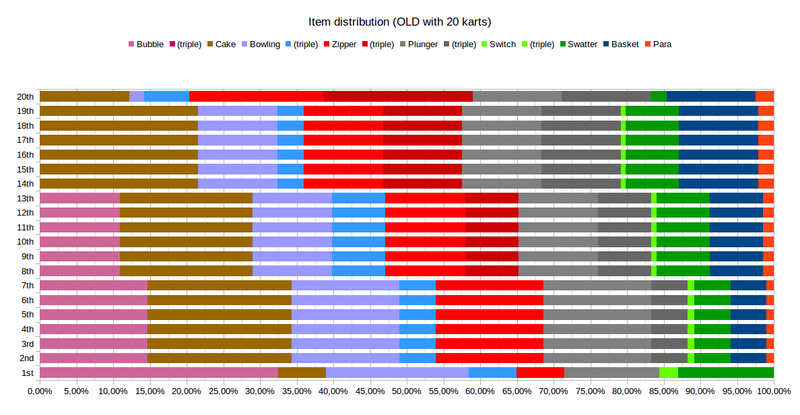 First of the main changes: the kart classes have been rebalanced. People familiar with the previous versions may have noticed that heavyweight karts were useless, as they were equal or inferior to medium karts in everything. Lightweights were superior for abusing unintended shortcuts but otherwise worse. Now, each kart class has different acceleration, top speed, nitro consumption, maneuverability... values which have been carefully tuned so that each kart class is best in some tracks and race conditions. For example, the higher top speed of heavy karts is valuable in tracks with gentle curves and in time-trials, while lightweights fare better when maneuverability and acceleration after crashes matter. 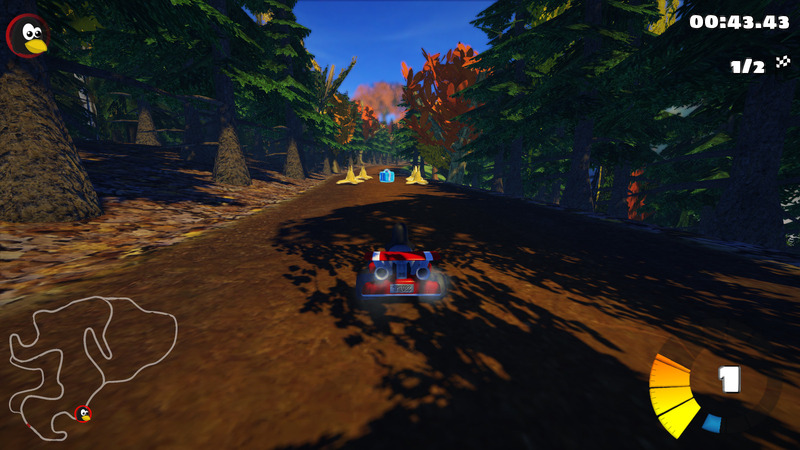 We have also improved turn radius, making sure all karts within a class behave the same and none is harder to drive. The second main change has been improvements and fixes to track themselves. A huge amount of unwanted shortcuts and skips (some of them exploiting rescue) has been patched. This ensures that online races won't see players abusing such issues to beat others driving along the intended path, except one which has been left for adventurous players to discover. 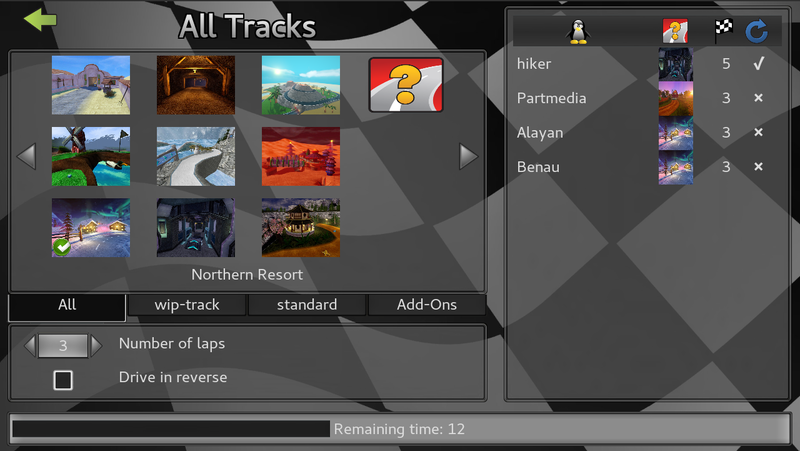 Next, the locations of item boxes, nitro cans and bananas on many tracks have been reworked to enhance balance and fun. Too easy to catch big nitro cans (giving a big advantage to the player taking them first) have been moved or changed to small cans, and item boxes too close to the start line or to other item boxes have been moved or removed. 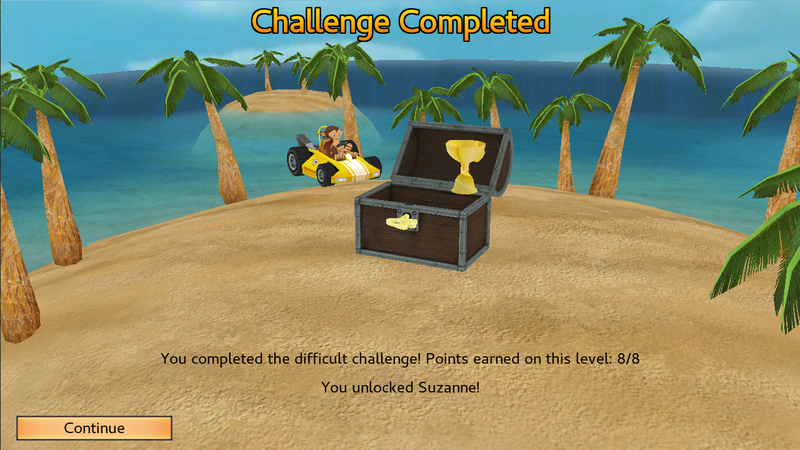 On Volcano Island a few bananas have been added to enhance the challenge. The third main change is a rework of slipstreaming. Slipstreaming is the speed bonus you get from being close behind another kart. In real life, the speed boost from being shielded from wind by another vehicle is small but continuous. 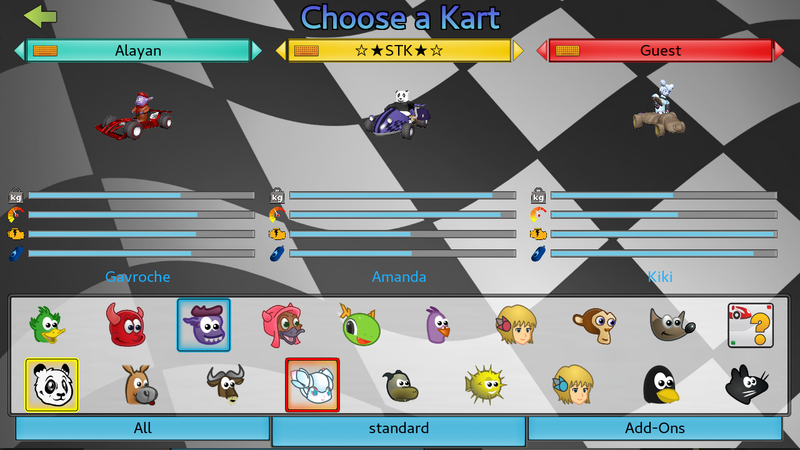 In STK, it is cartoony : you are made aware of being in the boost zone by an animated air movement, and only activate the speed boost when you stop following the other kart after having been in the boost zone long enough. In the upcoming release the air movement gets faster and its colour changes from white to yellow to make it easier to see when a boost has been charged. The slipstream boost has also been improved to provide a healthy max speed and acceleration boost, but more progressively and much less likely to cause the player to crash. The slipstream area where the boost can be collected is wider and longer. It is divided in an inner area and an outer area, if closer to the followed kart, less time is needed to accumulate the bonus. 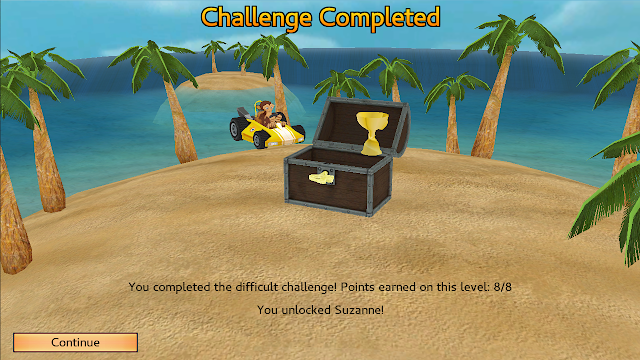 It is also much easier to collect boost in curves, so you can get the boost there too! Finally, a deep rework of powerup probabilities has been done. While the set of available powerups is the same as 0.9.3, their distribution has been greatly improved in several regards. 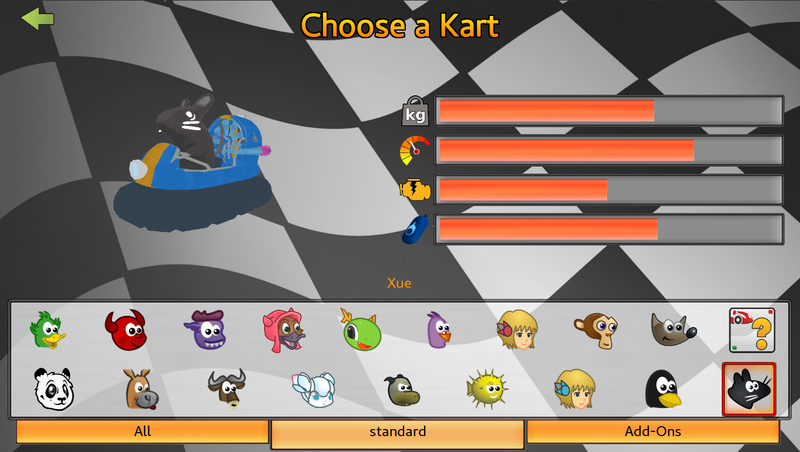 Karts were put in a group depending on their position, and each position in the group yielded the same item probabilities. 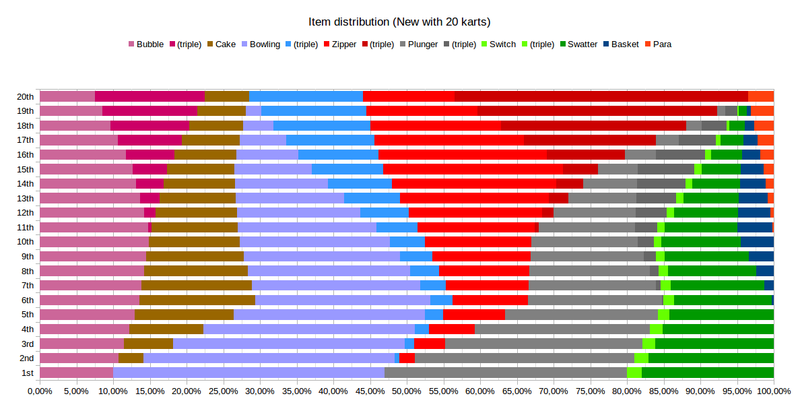 For example, in a 12 karts races, 2nd and 4th had the same item probabilities. The same set of weights was used from 1 to 20 karts. Follow the Leader mode used the same weights as normal races. Karts behind had a strong tendency of destroying each other with explosive cakes and other attacking powerups. Each position get unique weights, by averaging weights between reference values. The item probabilities evolve progressively with the position instead of suddenly. Several set of weights are used to account for the different dynamics depending on kart number. 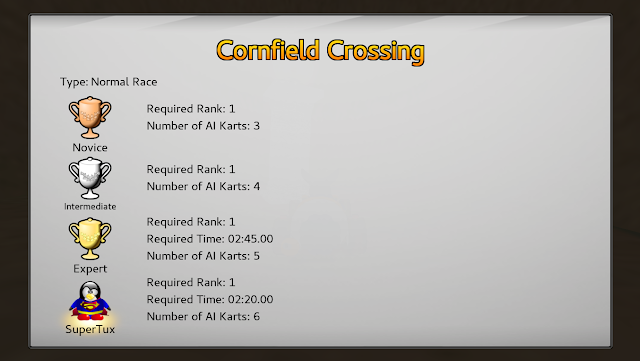 For example, the last kart in a 20 kart races is much more likely to get a triple zipper than the last kart in a 5 kart races. 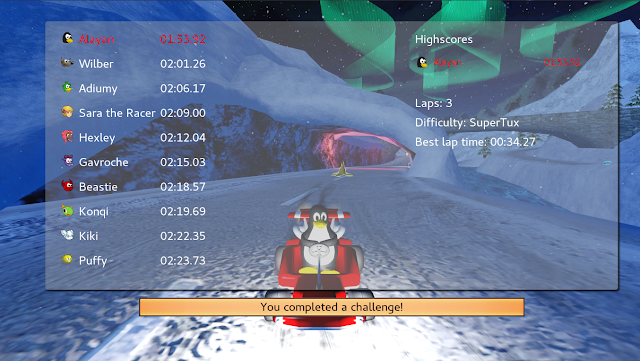 Values for number of karts between the reference points are interpolated. This is also used to better control the amount of global items (like parachutes or the swapper). Follow the Leader mode gets customized weights. While karts in the middle still attack each other more than they can attack the first kart, this is less damaging and bubble shields are available. Cakes and basketballs are now unavailable during the 15 first seconds of a race. Explosion duration, whether from weapons, bombs or track hazards, have also been shortened, in order to make them less punitive. In the long term, we plan to introduce new powerups in STK to make gameplay more varied and to overcome some shortcomings of the current set, but these changes shipping in the next release are a huge step forward. When doing a quick (yellow) drift after a long (red) drift, the stronger bonus of the red drift is no longer removed. Instead, it last until its normal end, and if the quick drift should end later, it will then take effect. The startup boost requires to press the acceleration button quickly after "set" instead of "go". This change has mostly been done for online multiplayer as it allows the clients to better predict how other karts start. 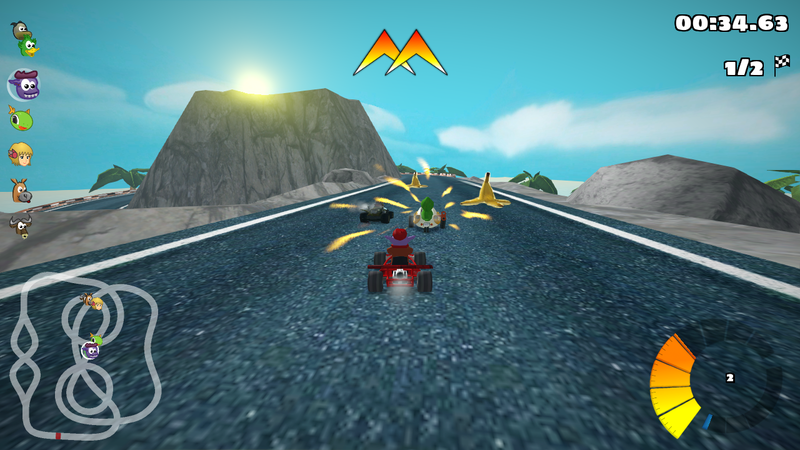 Physics have been improved: karts are much less likely to be catapulted flying across the track after a strong collision against a wall or some other obstacle, and always remain controllable in downward slopes. When nitro is consumed during the minimum nitro consumption time, the kart will always get the boost whether or not the player keeps pressing the nitro key. Burning a tiny amount of remaining nitro (less than the normal minimum use) provides a shorter boost. 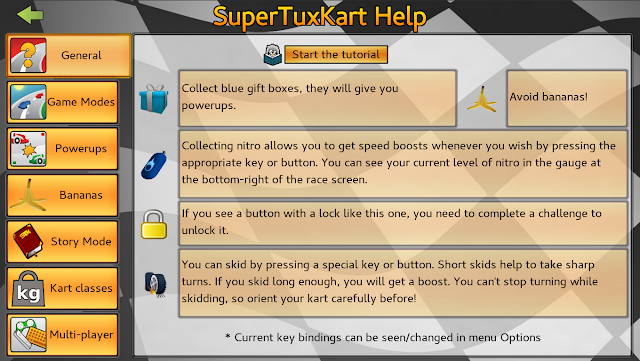 The AI is being smarter about how it uses nitro and items (which is more of an AI enhancement than a direct gameplay enhancement), and the way the AIs slow down in easier difficulties has been changed to be more forgiving towards players and to avoid all AI karts being very close to each other. 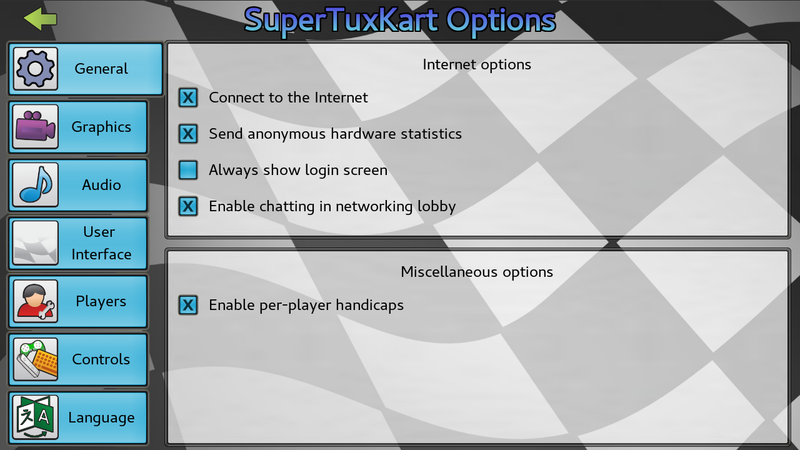 It has been around 2 months since we did our alpha release of the online racing implementation in SuperTuxKart. First of all a big "Thank You" to all the people who went through the effort of downloading and compiling SuperTuxKart themselves. They have provided very valuable testing and feedback for us, and as a result we have reworked some of the code to make it more user-friendly, and removed some bugs. I am also quite proud of our testing team: essentially no significant bugs in the actual online racing was found during the alpha - so a great job by all of our testers and coders! There was a tireless effort especially by Benau, Deve, and Alayan to constantly improve our code! Also a big thanks to players who have volunteered their hardware to provide more servers for us. Even during the alpha we had typically more servers than actual players. Hopefully this beta release will allow more people to participate in online races. We are now confident that our code is stable enough for a beta release: 0.10-beta1. This means that we will provide our usual set of binaries and installers for all supported platforms. And hopefully that means that many more people will be able to test this current version. Note that we consider this beta very stable, de-facto very close to a release candidate. But we are waiting for another track to be ready to be included, so we are using this time to give more players the opportunity to test (or re-test) our online racing implementation. 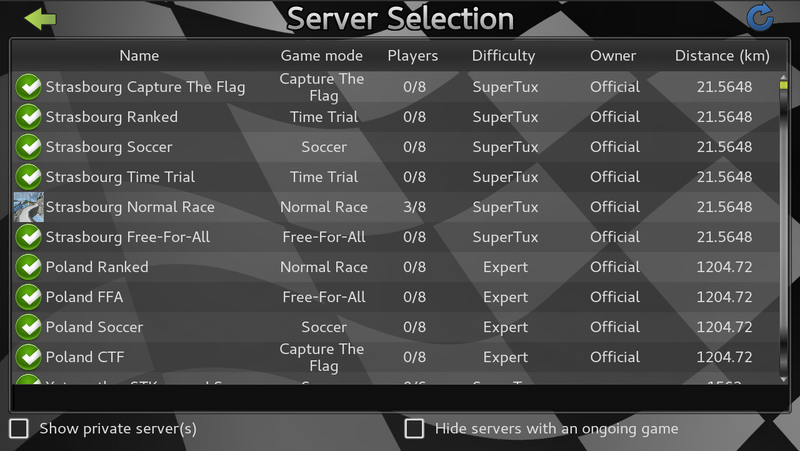 You can now race against your friends or people world-wide in online races, either in LAN or WAN games. 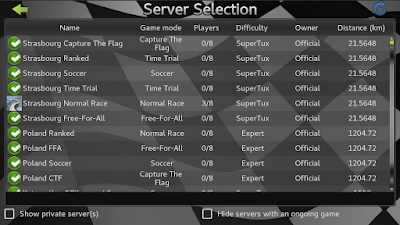 You can either run a server on your own computer, all handled by SuperTuxKart, fire up a stand-alone server, or connect to servers already running. A Raspberry Pi 3 is powerful enough to act as a game server (though you need a server-only binary). 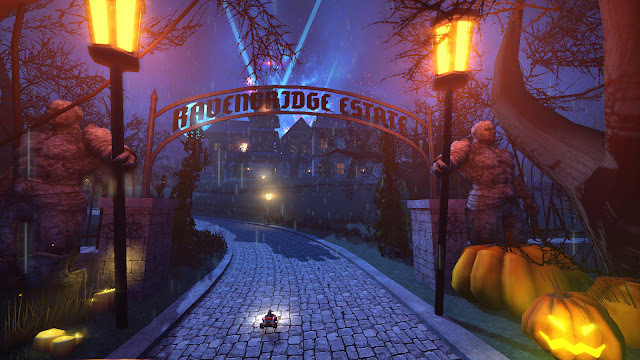 We provide several game servers on VPS and Pis that are constantly up. On special so-called 'ranked servers' a global ranking of online players is maintained. You can see the current ranking here. One important caveat: the network implementation is actually quite sophisticated (I might do a separate blog post about its implementation), but there are still limits in what we can do about the latency (or ping) between clients and servers. We strongly recommend to find a server with a ping of under 150ms for a smooth playing experience. The ping to the server will be shown when you connect to it. 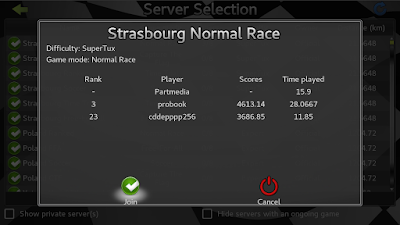 You can of course try servers with higher latency - while it should still work, you might notice more often that karts stutter, drive like drunk (though that might of course also be the skill of the other players) or are 'teleported' around. In addition you need a stable connection, so if you experience significant packet loss or jitter you will see the same strange behavior. 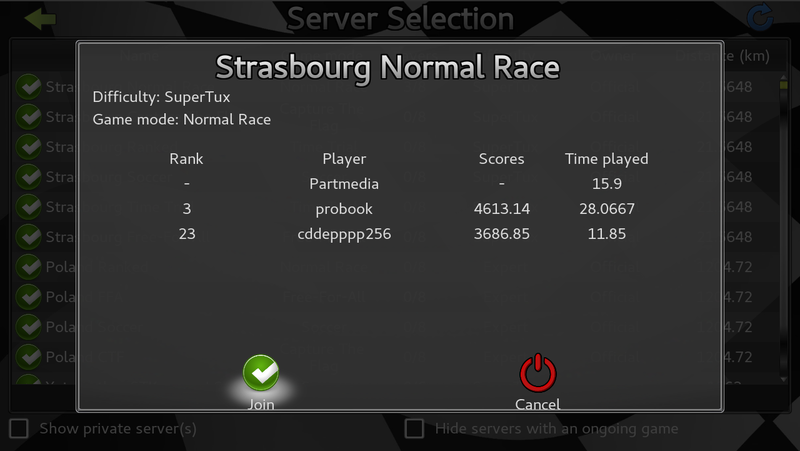 And new in this beta compared with our alpha (besides bug fixes and GUI improvements) is the possibility to now join a server while a race is in progress: you will become a spectator and can follow the race-in-progress. You will be joining the actual racing fun when the next race starts. We have now pretty much declared a feature freeze to prepare for our release candidate, once we get the new track added. One noticeable difference to one of our release candidates is that we did not update all translations: this usually delays a release by two weeks, and we would like more testing to be done earlier. 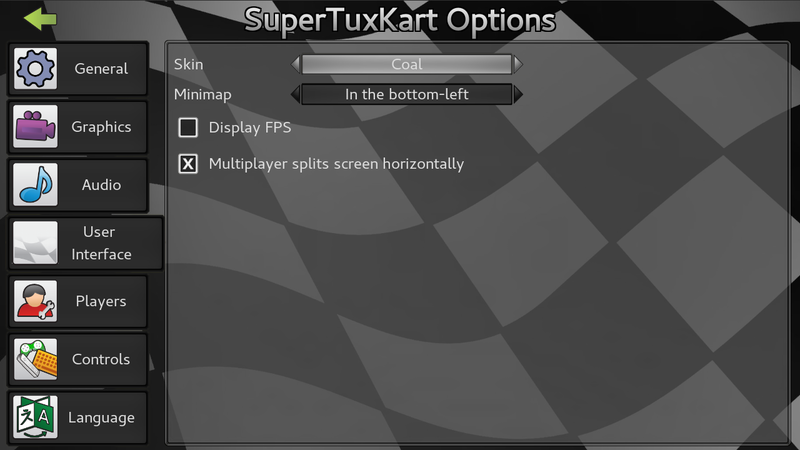 On the other hand, we hope that there won't be too many changes between the beta and the release candidate, and that we will soon be able to get onto the official release of online SuperTuxKart. You can download the beta from SourceForge. Feedback as always is welcome, ideally on our forum, which is also the best location for support requests. Bug reports can be submitted to our tracker on Github. Note that bug reports and support requests here as a comment are not ideal, and might easily get missed, so please use the appropriate URL above. 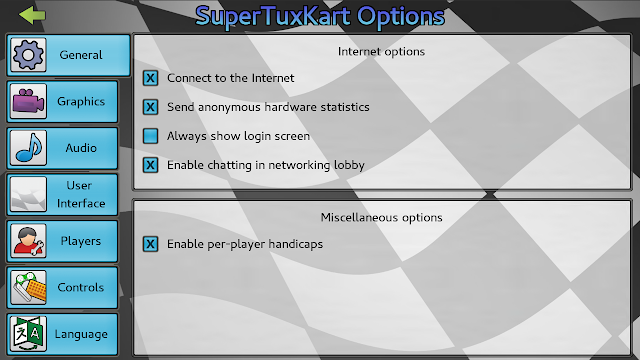 We hope you are all going to enjoy SuperTuxKart with online races!